Girls loved to play with doll's houses, miniature versions of real homes. 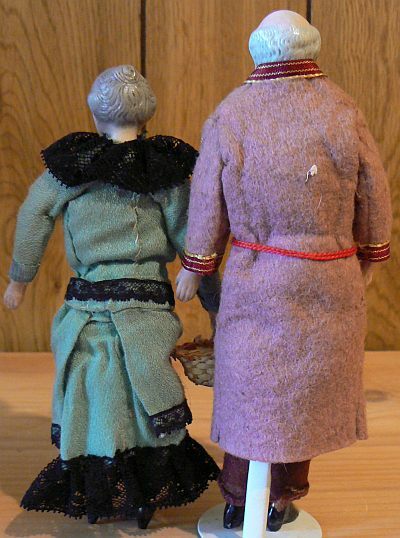 Thus minature dolls were needed to complete those doll's houses. 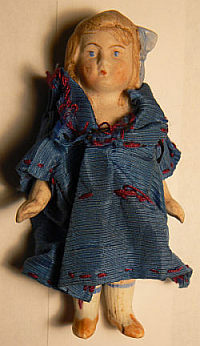 These rather small dolls were produced in different sizes depending on the proportion of the doll's house. 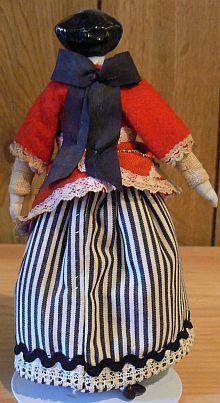 The little dolls were well-loved for play and supported the educational intention of training girls for their expected future role as well. 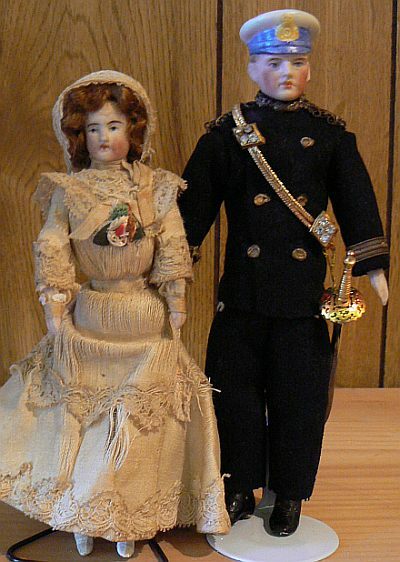 Early materials for these dolls were porcelain and wood. In einem Puppenhaus, eine Miniaturversion eines echtes Hauses, "leben" Puppenstubenpuppen. Diese ziemlich kleinen Puppen gab es in verschiedenen Größen, je nach dem Größenverhältnis des Hauses. Die Püppchen waren beliebtes Spielzeug und unterstützen genauso die erzieherische Absicht, Mädchen auf ihre künftige Rolle vorzubereiten. Frühe Materialien für diese Puppen waren Porzellan und Holz. This girl doll is made of porcelain. 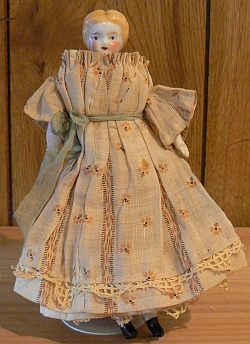 These kinds of dolls were produced in vast numbers. She has modelled shoes, socks and a hairbow. 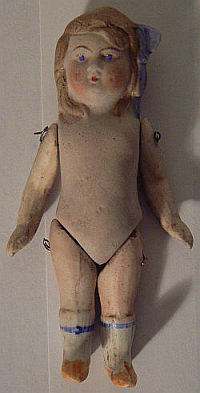 Her legs and arms are movable and attached with wire to the body. She wears an apparently original blue dress with red trimming. She was probably produced in Thuringia, Germany during the 1920s. Dieses Puppenmädchen ist aus Porzellan. Diese Art Puppen waren Massenware. Sie hat modellierte Schuhe, Strümpfe und Haarschleife. Arme und Beine sind beweglich und mit Draht am Körper befestigt. Offensichtlich trägt sie ein originales blaues Kleid mit roter Verzierung. Sie wurde wahrscheinlich in Thüringen in den 1920ern hergestellt. 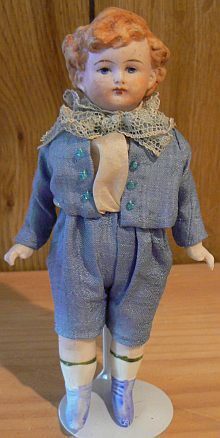 This bisque-porcelain boy is wearing a light blue silk suit made of old material. He was produced about 1920/30. Der Puppenjunge ist ganz aus Biskuit-Porzellan. Bekleidet ist er mit einem hellblauen Seidenanzug aus altem Material. Hergestellt wurde er um 1920/30. 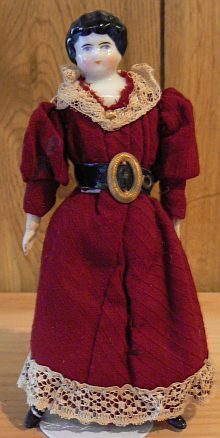 The lady doll was produced about 1900/10. She is wearing original clothing. Unfortunately the cloth is now a little fragile. Head, hands and lower legs are bisque porcelain, the body is cloth. The navy officer wears his original uniform and sabre. 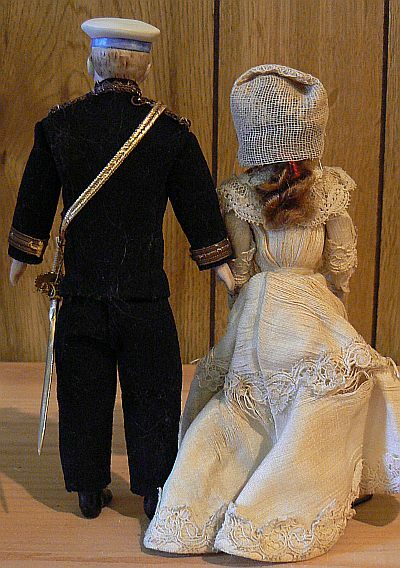 His bisque head and cap are modelled. He was produced in the 1920s. Die Puppendame wurde um 1900/10 hergestellt und ist original bekleidet. Leider ist der Stoff schon etwas brüchig. Kopf, Hände und Unterschenkel sind aus Biskuit-Porzellan, der Körper ist aus Stoff. Der Marine-Offizier trägt seine originale Uniform mit Degen. Sein Kopf mit modellierter Mütze ist aus Biskuit-Porzellan. Er wurde in den 1920ern hergestellt. Grandma and Grandpa were made about 1910. Both are wearing their original clothing. Heads, hands and lower legs with shoes and boots are bisque porcelain. Die beiden älteren Herrschaften wurden um 1910 hergestellt. Beide tragen ihre originale Bekleidung. Köpfe, Hände und Unterschenkel sind aus Biskuit-Porzellan. Die Schuhe (Oma) und Stiefel (Opa) sind ausmodelliert. 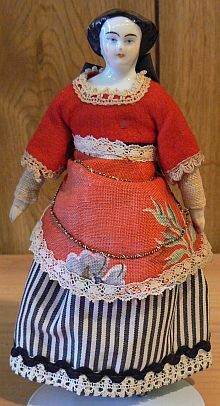 Parlor maid in original clothing, produced after 1900. 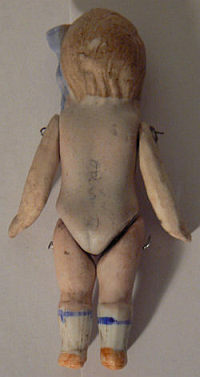 The head is glazed porcelain, hands and lower legs are bisque porcelain and the body cloth. Stubenmädchen in originaler Kleidung, die nach 1900 hergestellt wurde. Der Kopf ist aus glasiertem Porzellan, Hände und Unterschenkel sind aus Biskuit-Porzellan und Körper und Arme sind aus Stoff. 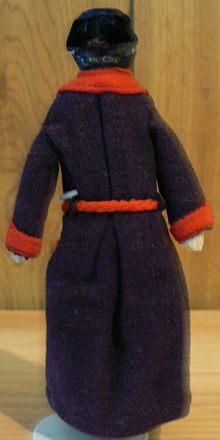 A Biedermeier gentleman in original dressing gown. His head is glazed porcelain, hands and legs are bisque porcelain and the body cloth. Ein original bekleideter Biedermeier-Mann im Hausmantel. Sein Kopf ist aus glasiertem Porzellan, die Hände und Beine sind aus Biskuit-Porzellan, der Körper aus Stoff. A Biedermeier lady in original dress. Her head is glazed porcellan, hands and legs are bisque porcelain and the body cloth. Eine Biedermeier-Dame in originaler Garderobe. Der Kopf ist aus glasiertem Porzellan, die Hände und Beine sind aus Biskuit-Porzellan, der Körper aus Stoff. This lady wears old clothing but we are not sure it is original. 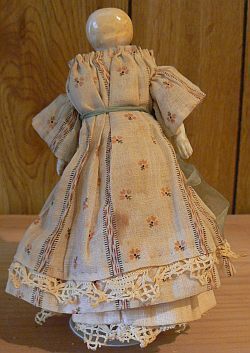 Her head is glazed porcelain, hands, arms and lower legs are bisque porcelain and the body cloth. 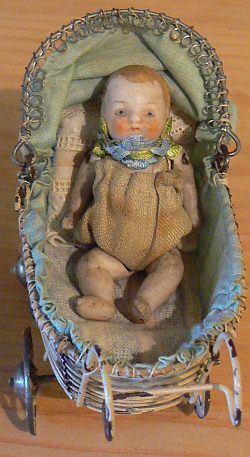 She was made about 1900 or a little earlier. Die Puppendame trägt alte Kleidung, aber ob sie original ist, ist unklar. Der Kopf ist aus glasiertem Porzellan, die Hände, Arme und Unterschenkel sind aus Biskuit-Porzellan, der Körper aus Stoff. Sie wurde ca. um 1900 oder etwas davor produziert. This bisque porcelain baby has a 5-part body. The baby carriage is painted metal and has a cloth folding top. 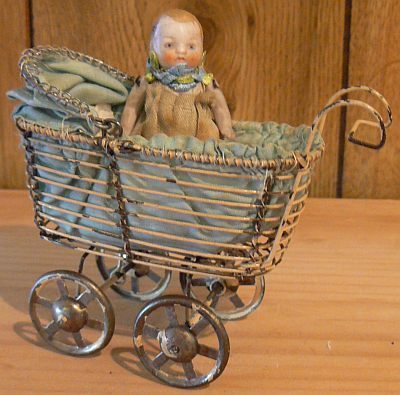 Baby and carriage were made in the 1920s. Das Biskuit-Porzellan-Baby hat einen 5-teiligen Körper. Der Puppenwagen aus bemaltem Blech ist mit einem Stoffverdeck ausgestattet. Das Baby und der Wagen wurden in den 1920ern hergestellt. This market lady was probably made by Gaultier about 1910. The clothing is original. The head is bisque porcelain and has a cork lid on top with glued-on hair. Arms, hands and lower legs are made of composition, the body is cloth. Die Marktfrau wurde vermutlich von Gaultier um 1910 hergestellt. Die Kleidung ist komplett original erhalten. Der Kopf aus Biskuit-Porzellan hat einen Korkdeckel mit aufgeklebten Haaren. Arme, Hände und Unterschenkel sind aus Masse, der Körper ist aus Stoff. Das Impressum finden sie unter Contact. The site owner is not responsible for the contents of any external links from this page. Unless otherwise noted, all rights reserved by Birte Koch (ALBUM 1900). Copyright 2001-2018 by Birte Koch (ALBUM 1900). See Haftungsausschluss/Disclaimer for more details! Haftungsausschluss/Disclaimer are valid for every single page belonging to Album1900.com. This homepage does not infringe on the copyright of the Käthe Kruse GmbH. All depictions follow the fair use standard. 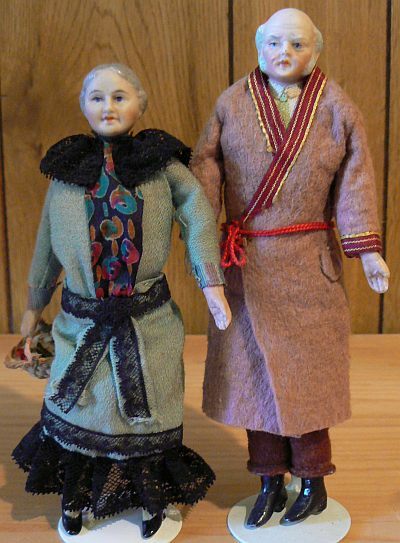 The sole purpose of this homepage is to give fans the opportunity to enjoy the beautiful Käthe Kruse dolls. The views expressed in the project "Memories" do not necessarily reflect those of Album 1900.
und lediglich aus historischem Interesse Fans Gelegenheit zur Bewunderung der Puppen geben soll. und stellen keine redaktionelle Meinung von Album 1900 dar.